In 1927, S.E. Fraze bought the former Joel Converse Residence in Union City, IN and turned it into a funeral home. The home is recorded to have been built in 1864. Originally, Mr. Fraze's family had started a funeral business in 1886 in Winchester, IN before coming to Union City. The house has been used as a funeral home ever since then, spanning over 75 years of service. From 1956 - 1978, it was known as Fraze & Timmons Funeral Home, when Pete Terhune was the owner. 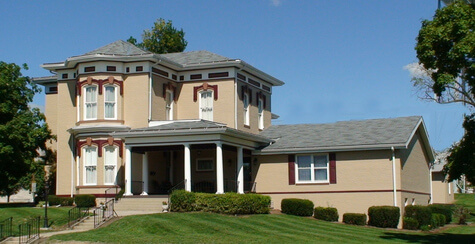 Brooks Funeral Home was started in Union City, IN in 1919 by Russell Brooks. He was later joined by his sons, Roger and Earl, in the mid 1930s. The funeral home was family owned up until 1975, when Roger and Earl sold it. In the late 1970s, Joseph Davis bought both funeral homes and merged them together, forming Fraze-Brooks & Davis Funeral Home, operating both locations. It remained this way until the early 1990s. Today, it is simply known as Fraze-Brooks Memorial Chapel. It still operates from the original Fraze Funeral Home building.